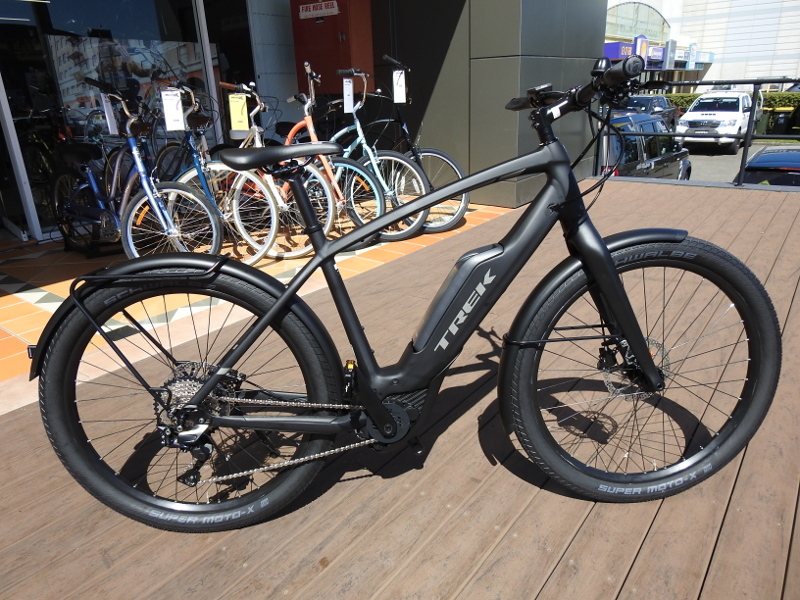 2019 model Trek and Electra e-Bikes Have Arrived! Alpha Platinum Aluminium - Our premium lightweight aluminium is continuously cold extruded and butted at multiple points, and hydroformed into sophisticated tube shapes for maximum strength and minimum weight. Bosch Performance CX - Bosch's performance CX line is made for rugged off-road use with a maximum torque of up to 75 newton metres, sustained power into the high cadence range for sporty acceleration and sleek mid-mount motor for ideal weight balance and obstacle clearance. Bosch PowerPack 500 - The premium Bosch lithium-iron battery features 500 wh and guaranteed long lifespan. The battery not only ensures long distances, but is easy to remove and take with you. Bosch Purion Display - Bosch's Purion display features a fully functional speedometer with a backlit display, service interval indicator and battery range indicator. It's thoughtful design allows riders to scroll through functions or choose the right level of support while maintaining contact with the handlebars. Motor Armour - This unique protection shield made of lightweight but robust aluminium protects the motor against stones. Powerfly LT 9 is the top-end alloy full suspension electric mountain bike in the lineup. 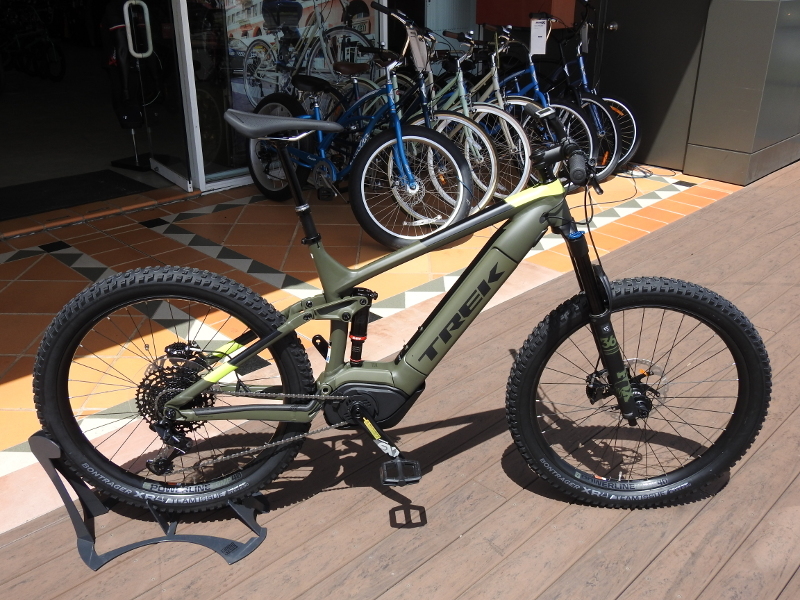 Longer travel 150mm/160mm suspension with Trek's exclusive RE:aktiv damper, a powerful Bosch pedal-assist system, 27.5+ mid-fat tires for extra traction and capability, a wide-range 1x12 SRAM drivetrain, and 4-piston brakes give Powerfly LT 9 true trail bike performance and the ability to go farther, faster, and bigger than you ever thought possible on an e-MTB. It's right for you if... You ride rugged trails, and you're ready to go farther and faster than ever. You want the best trail bike capability, the latest in mountain bike and e-MTB tech, and enough suspension to soak up the big hits and obstacles you'll encounter. The tech you get - A durable Alpha Platinum Aluminum frame and fully-integrated long-range 500Wh battery, a Bosch Performance CX motor and Purion controller. 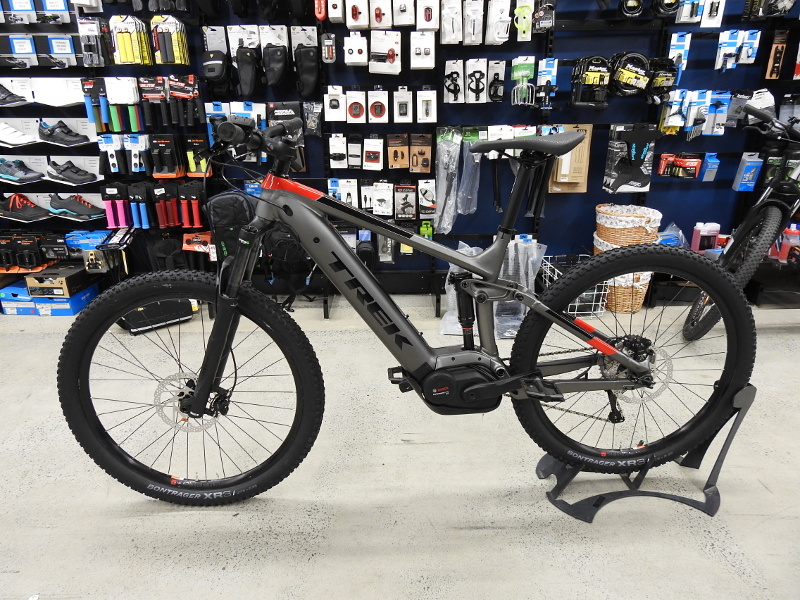 Plus, an e-bike optimized FOX 36 fork with thicker, stiffer legs, RockShox rear shock with RE:aktiv damper, grippy 27.5+ mid-fat tires, e-bike specific Powerline Comp 40 wheels with a 54-tooth Rapid Drive hub, a Bontrager Line dropper post, and a 1x12 SRAM GX Eagle drivetrain. The final word - This e-MTB checks all the boxes for rugged trail bike capability. 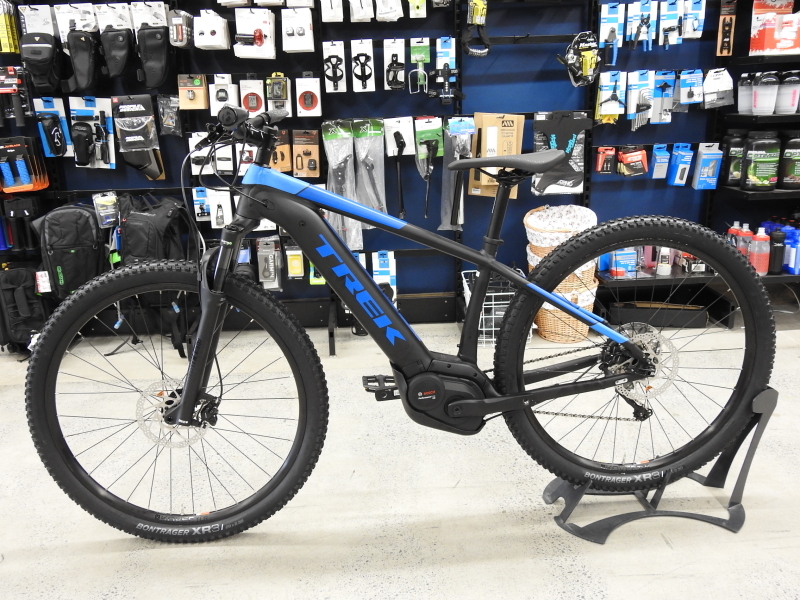 It has high-end trail spec, long-travel suspension with advanced damper tech, upgraded Bontrager wheels, and a powerful Bosch pedal-assist system. All together, that makes for a ridiculously capable performance ride that's the perfect companion for serious trail outings. It's right for you if... You want to push boundaries and go to otherwise unreachable places on your mountain bike. You want all the benefits of an advanced pedal-assist system along with the handling, suspension performance, and capability of a true 27.5+ mid-fat trail bike. The tech you get - A durable Alpha Platinum Aluminum frame that fully encases a long-range 500Wh battery for great aesthetics and ride quality on the trail, a Bosch Performance CX motor and an ergonomic Purion controller. Plus, 130mm front and rear travel with a RockShox Revelation RL fork, grippy 27.5+ mid-fat tires, Tubeless Ready Bontrager Line Comp wheels with a 54-tooth Rapid Drive hub, a dropper post, and an 11-speed Shimano SLX/XT drivetrain. The final word - Powerfly FS 7 is more than the sum of its parts. It has a high-performance Bosch motor and high-performance trail bike parts, but together these elements make a go-anywhere e-MTB that changes where and how you can ride. The pedal-assist system, dropper post, and 27.5+ mid-fat tires make it a great bike for exploring steeper, rougher terrain. It's right for you if... You want to bring more capability to your mountain biking in the form of a high-performance pedal-assist system. 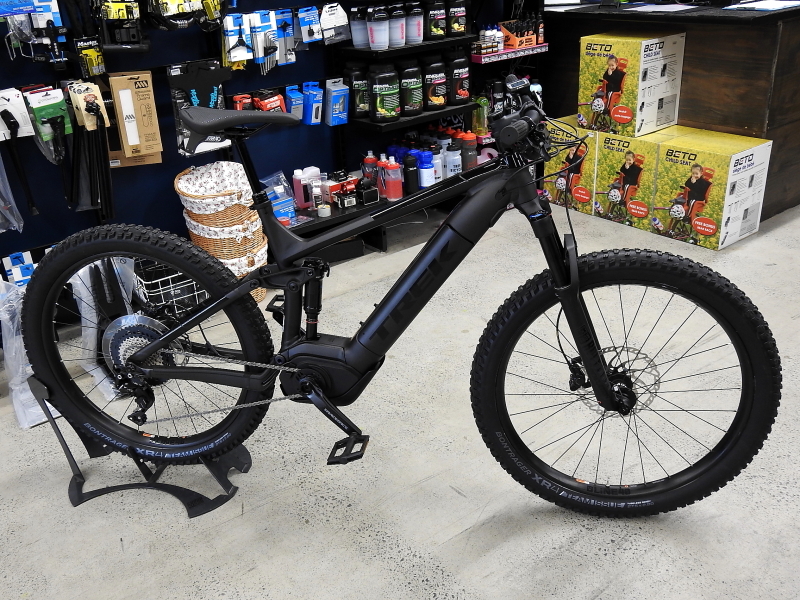 You know an e-bike can change your life and you want the plush ride of a full suspension mountain bike that will stand up to more rugged and technical trails. The tech you get - A durable Alpha Platinum Aluminum frame that fully encases a long-range 500Wh battery for great aesthetics ride quality on the trail, a Bosch Performance CX motor and an ergonomic Purion controller. Plus, 130mm front and rear travel with a RockShox Recon RL fork, Tubeless Ready Bontrager Kovee 23 rims, and a 10-speed Shimano Deore drivetrain. The final word - This bike pairs electric-assist performance with singletrack trail capability. It's a fun, forgiving, full suspension ride that can help you reach new destinations on rugged trails with pedal-assist of up to 25 km/h. It's right for you if... You want to ride more, explore longer trails, and have more fun! Ease of use is a big priority, so you're looking for an e-MTB that's not just wildly capable but also has new tech specifically designed for a better user experience. The tech you get - A durable Alpha Platinum Aluminum frame that fully encases a long-range 500Wh battery for great aesthetics and protection on the trail, a Bosch Performance CX 250-watt motor that assists up to 25 km/h, and an ergonomic Bosch Purion controller. Plus, a 100mm RockShox Judy Silver TK fork, Tubeless Ready Bontrager Kovee 23 wheels, a 10-speed Shimano Deore drivetrain, and hydraulic disc brakes. The final word - Our new Removable Integrated Battery (RIB) system is a major new advancement in e-MTB tech. 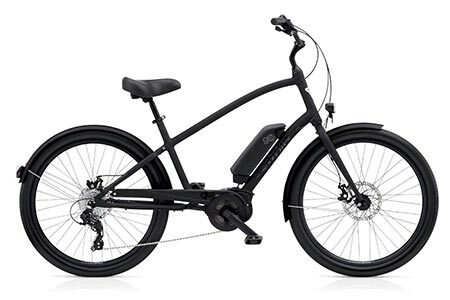 It gives you the sleek looks of a traditional mountain bike and makes it much easier to remove the battery for charging, while still giving you all the fun and performance advantages of a powerful and trail-tough Bosch electric bike system. Super Commuter+ 7 is a performance e-bike built for commuters who value reliability, speed, and style. A powerful Bosch system that helps you sustain speeds of up to 25 km/h, a wealth of thoughtful design details, and a parts group that's friendlier on the wallet than others in the lineup make this electric bike a high-value solution for better daily commutes. It's right for you if... You're an urban dweller looking for a better daily commute with an electric bike that earns top marks in style. You value reliability, durability, sophisticated looks, and ease of use. The tech you get - The heart of Super Commuter+ 7 is a 250-watt Bosch Performance Line motor that helps you sustain speeds of up to 25 km/h. It's equipped with a long-lasting Bosch PowerPack 500 battery that's easy to remove for charging at any household outlet, and an elegant Bosch Purion display that lets you check your speed, distance, and battery range. 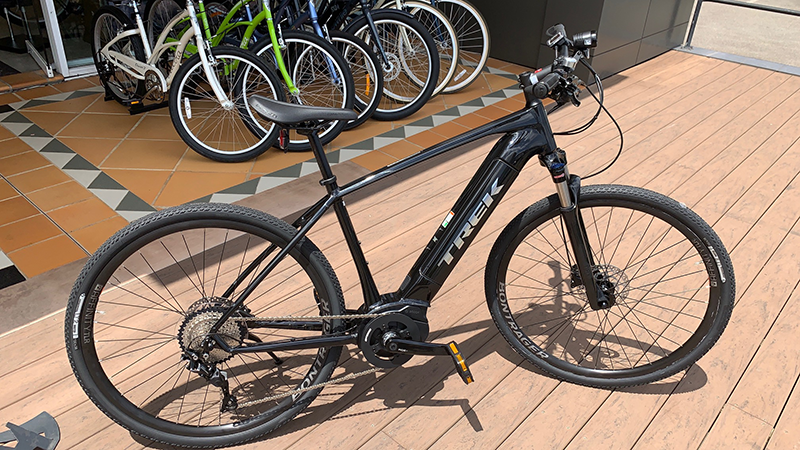 Plus, a 10-speed Shimano Deore drivetrain with hydraulic disc brakes for all-weather stopping power, fenders, a rear rack, and both front and rear lights. The final word - This sophisticated e-bike earns top marks in tech, style, and value. It's equipped with a powerful Bosch system, loads of thoughtful design details, and a high-value parts group chosen for reliability and durability over the long haul. Verve+ Lowstep is an electric hybrid bike designed for comfort on commutes, daily cruises and recreational rides. It features a step-through-style frame for easy mounting and dismounting and a Bosch system capable of sustaining speeds of up to 25 km/h. 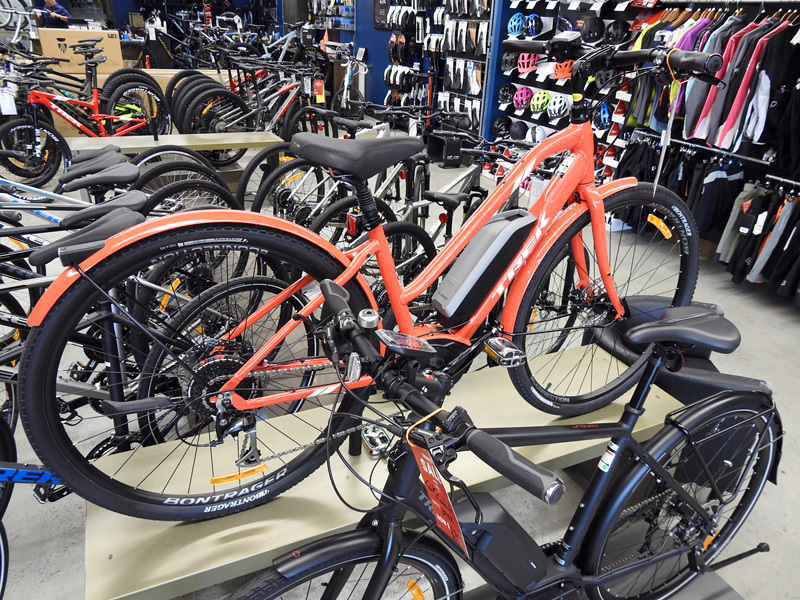 Plus, our most affordable e-bike comes fully stocked with accessories like integrated lights, mudguards and a kickstand! It's right for you if.. You want to get more enjoyment out of your rides, and know that the extra boost of an e-bike will help you see and do more. You value comfort, and want a ride that's capable, versatile, reliable over the long haul and equipped with the latest e-bike technology. The tech you get - A lightweight aluminium frame with a step-through geometry, a 250-watt Bosch Active Line mid-drive motor capable of sustaining speeds up to 25 km/h, a PowerPack Performance 400 Wh battery and a handlebar-mounted Bosch Purion controller. Verve+ Lowstep is also equipped with commute-ready features like an integrated Lync light system, wide 45 c Bontrager H5 Hard-Case Ultimate tyres for extra stability, Shimano hydraulic disc brakes for all-weather stopping power, mudguards and a kickstand. The final word - Verve+ Lowstep doesn't replace your power, it amplifies it. Our most affordable e-bike gives you an extra boost so you can enjoy riding more, in whatever way you choose. Quality components, a comfortable geometry and a powerful pedal-assist system make Verve+ Lowstep great value and a whole lot of fun. From local rides on the road to off-road winery tours, Dual Sport+ is a go-anywhere electric bike that helps you get outside, stay active and have fun. 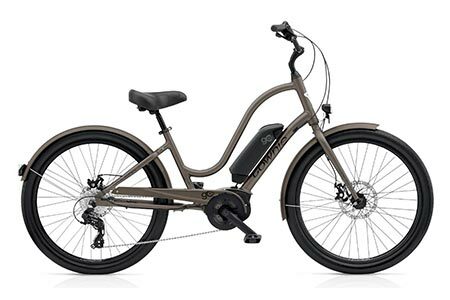 A powerful, reliable Bosch drive system that helps you sustain speeds up to 20 km/h, front suspension, integrated lighting and an extraordinary amount of capability make it the perfect e-bike for anyone who wants to explore more than one kind of terrain. Capable, modern, sleek. Dual Sport+ is more than an e-bike. This ride can take you anywhere, at any time. Whether you're cruising the neighbourhood, commuting or exploring dirt tracks, Dual Sport+ delivers the best in new e-bike tech and a wealth of new features that make for a comfortable, fun ride. Electra Townie Go! - 2019 models have arrived! New model Electra Townie Go! bikes have arrived and are now on the floor! All Townie Go! feature Electra’s patented Flat Foot Technology® and the Bosch Active System with Purion Computer display and are a blast to ride. Just get on and Go!